Nursing Schools Brace For Faculty Shortage : Shots - Health News Over the next few years, the Affordable Care Act will probably boost demand for nurses to take care of the newly insured. But with many nursing faculty retiring, and not enough in the pipeline, nursing schools will have a challenge training the next generation of nurses. 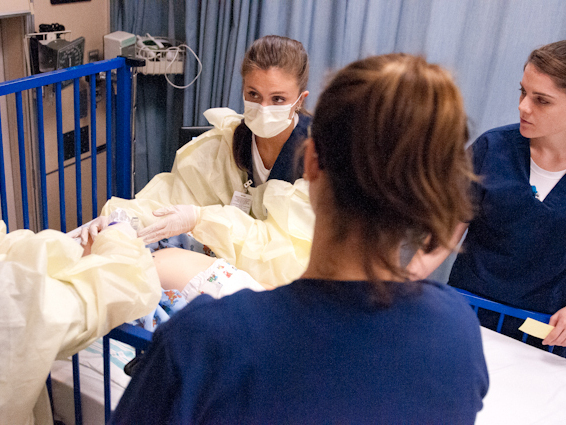 Nursing students in a simulation lab at the University of Virginia School of Nursing. There have been lots of goodbye parties this year at the University of Virginia School of Nursing. So far, 11 professors have retired. That's one-fourth of the faculty, and Dean Dorrie Fontaine is in no mood to celebrate. Over the next few years, the Affordable Care Act will probably boost demand for nurses to take care of the newly insured, she says, "and I need faculty to teach the practitioners that are going to take care of these uninsured." In the last year, more than 76,000 qualified applicants were turned away, in large part because nursing schools didn't have enough professors. Polly Bednash, executive director of the American Association of Colleges of Nursing, says nurses comprise the oldest workforce in the nation, and many of them kept working during the recession. "They are going to leave in droves and are already leaving in some places where the economy is getting better," she says. Finding professors to teach new nurses will be difficult because faculty members usually need a Ph.D. Of 3 million nurses in this country, less than 1 percent have their doctorate. Emily Drake, an associate professor of nursing at UVA, says most nurses want to practice right away. "After you finish your degree," she says, "what we want to do is take care of patients." Pay is also a problem. Nurses with a master's degree and special training can be certified as nurse practitioners — and be paid $120,000 a year or more. After 10 years as a professor, Drake earns about $75,000. It's about more than the money, though. Fontaine says that by the time most nurses consider a Ph.D., their lives are complicated with a job, financial obligations and children. She says diversity in the teacher population is missing, too. "We want to have our faculty and students match the population we serve," Fontaine says, "so we do not have enough Hispanic nurses or faculty, as well as African-Americans and other minorities – and men!" Men make up just 10 percent of the nursing workforce, and Fontaine hopes the field can draw more of them to join women in getting Ph.Ds and stepping into the classroom. Drake says classes can't get bigger because much of the training for nurses is hands on. "By law for each additional 10 students we take, we need another clinical faculty member to supervise them in the hospital," she says. Bednash says schools are looking for other ways to teach. "Faculty are getting more and more creative about how they prepare students," she says. "They bring in other clinicians to the educational experience – having pharmacists, for instance, be involved in teaching the pharmacotherapeutics." They're also using technology — simulators and computer-based lessons — to supplement classroom and lab experience. Nationwide, nearly 8 percent of nursing school jobs — about 1,200 — are vacant, so the AACN is lobbying for more state, federal and foundation money to train Ph.Ds. And it is urging the most promising students to get the advanced degree before they acquire a family and a mortgage. This piece is part of a partnership with NPR, Virginia Public Radio and Kaiser Heath News.